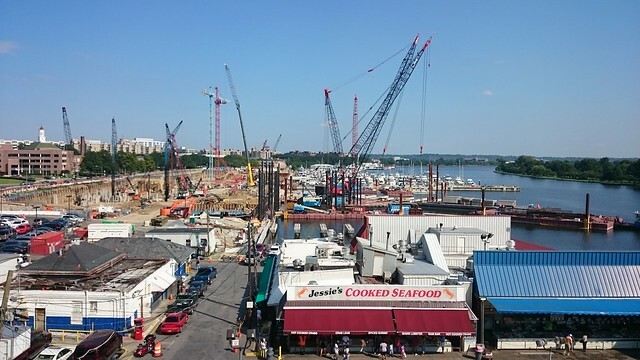 I’ve been trying out a faux-time-lapse-photo series of the ongoing construction of the Wharf, the mega-project just a few blocks down the street. 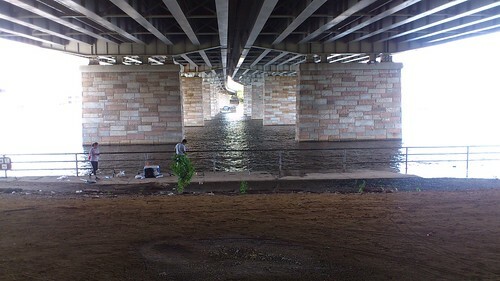 The photos are taken from the Case Bridge, under the “L’Enfant Promenade, Keep Right” sign. 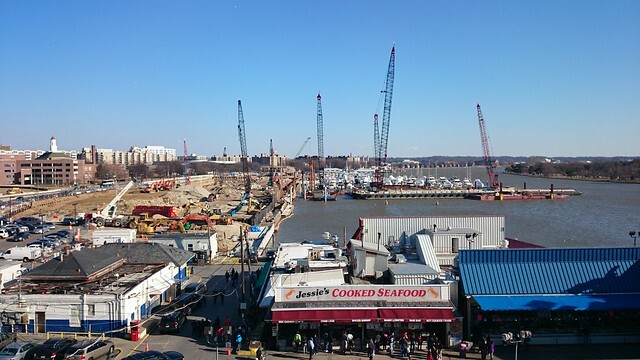 Since the lower photo was taken in March, the piers have been substantially completed, thousands of foundation piles have been nailed into the ground, excavation has been completed for the sitewide underground parking garage, and some of the first structural supports. 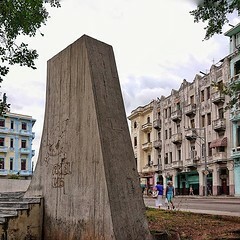 Since the site is just about at sea level, substantial pumping will continue to keep seawater out of the hole until the foundation is complete. Two of seven tower cranes have arrived on this side. 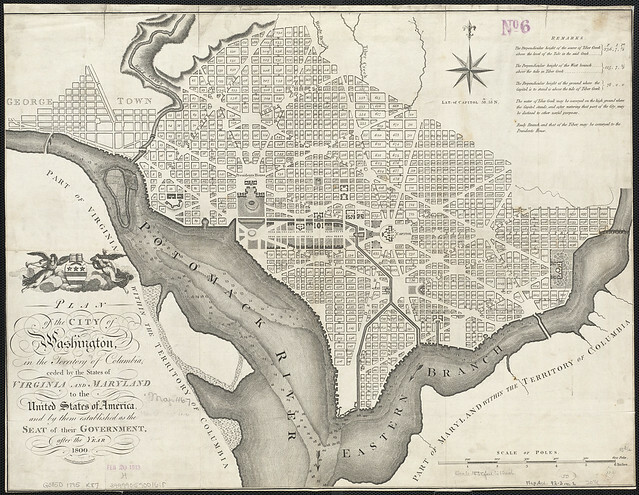 Also, be sure to check out my posts at Greater Greater Washington. I used to crosspost all of them, but haven’t done so as much lately. 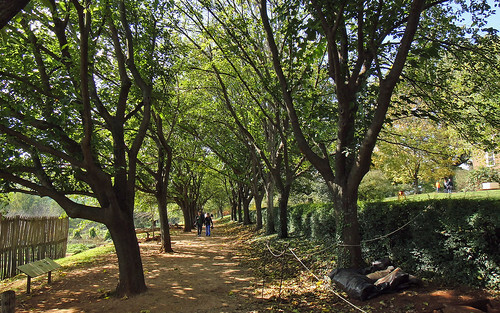 The first post in the watershed series mentioned that Morus alba (white mulberry) is a common invasive understory tree found at the edges of lawns along the Washington Channel, particularly along the unmown verge beside the fences that ring East Potomac Park’s recreation facilities. Given a chance, these shrubs will grow into a smallish tree of up to 15 meters, with a peculiar combination of lobed leaves on young shoots and heart-shaped leaves on older shoots. Its copious blackberry-looking fruits , which can disperse an estimated 20 million seeds per tree, make a convenient food source for birds and maybe humans — or else they leave a sticky purple mess on the walkways below. But wait, mulberry? Isn’t that what silk is made from? How did that end up here? What is this weed, and what does it have to do with the Opium Wars, Jefferson family wedding gowns, and deforestation in Ontario? Silk production, or sericulture, was invented in China at least 4,000 years ago; legend says it was discovered by a princess who was strolling through the woods with a cup of hot tea. Young mulberry leaves are fed to silkworms, which spin silk threads around their cocoon as they metamorphose into moths. 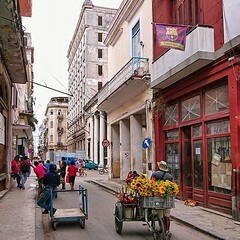 The cocoons are collected, boiled, and the threads are spun into fiber. China still accounts for most of the almost one million hectares (2.5 million acres) of mulberry under cultivation worldwide, according to the FAO, largely for silk but also for forage, wood, and even biofuel. Yet sericulture (silk cultivation) requires that both mulberries and silkworms thrive in tandem. Mulberries obviously have adapted well enough to the local climate; thousands of years of domestication has selected for robust and easily grown varieties. The silkworms are a different story: they’ve been raised indoors for thousands of years, and thus have evolved into a very narrow ecosystem — they don’t even survive in the wild anymore, and require an exacting temperature range of 73-84° F, with high humidities, in order to thrive. Silk was long one of the world’s most coveted agricultural products, and for centuries the world went to astonishing lengths to procure it from China. * Starting all the way back in Jamestown, Virginians attempted to get a cut of this lucrative trade by manufacturing silk: it seemed an ideal fit for the area’s warm climate and then-remote location, and potentially valuable both for the colonists and for British weavers. Yet while Virginia hews a bit closer to such temperatures than England, it isn’t exactly a room-temperature silkworm paradise. So while the robust mulberry thrived, fragile silkworms brought to Virginia didn’t, and instead Virginians profited off the native tobacco plant. your family of silk worms is reduced to a single individual that is now spinning his broach. to encourage Virginia and Mary to take care of it, I tell them that as soon as they can get wedding gowns from this spinner they shall be married. I propose the same to you that, in order to hasten it’s work, you may hasten home; for we all wish much to see you. For what it’s worth, neither Mary nor Cornelia ever married, although I doubt her silkworm colony’s failure to generate enough silk for a wedding gown had much to do with that. Silk was so valuable that Americans couldn’t be dissuaded by the industry’s failure in Virginia. Silkworms, as mentioned above, are fickle and highly adapted to the methods of Chinese sericulture; they feed almost exclusively on Morus alba, which as mentioned grows quite vigorously on Chinese farms. Eastern North America has a native variety of mulberry, Morus rubra, an understory plant suited to the area’s deep forests, but the silkworms rejected M. rubra feed. In the intervening centuries, the invasive M. alba has far outcompeted native M. rubra on its home turf: M. alba has spread much of the contiguous United States except for the desert Southwest, high plains, and taiga forest, and pushed M. rubra to endangerment in Connecticut, Massachusetts, and Ontario. 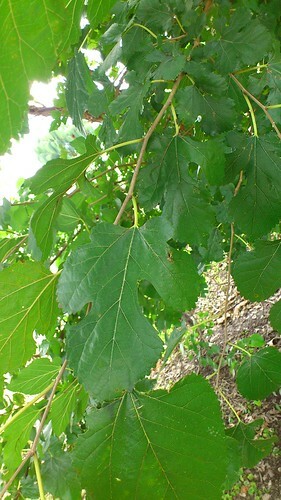 Not only have widespread planting efforts like those in Connecticut spread M. alba far and wide, but it’s a tree that’s been honed by centuries of breeding for vigor, with a “high growth rate and great adaptability to adverse environments,” according to the Global Invasive Species Database: “M. alba and hybrids were evaluated to be consistently more fit than the native M. rubra in a laboratory study.” M. alba hybridizes with, and spreads root diseases, to M. rubra. 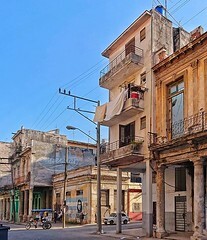 Widespread deforestation and urbanization in eastern North America opened up countless opportunities for sun-loving, early-successional species like M. alba, while concomitantly destroying the deep shade that M. rubra adapted to. * As a descendant of Cantonese merchants, perhaps I should be glad that these experiments failed? Oh, the complicated webs that history weaves for us! 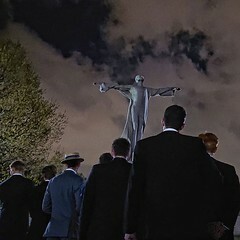 ** The mild success found in Connecticut indicates that perhaps it was less the climate, but Virginia’s lack of capital for indoor silkworm warms, that doomed the early industry. While Washington Channel is known for its fishing, it’s not because it’s a particularly inviting habitat for fish species. Instead, its unique flow pattern of imported water make it a “trap” for fish swept upriver by the tides, and as such it sees fish species that aren’t typically found in other local waters — which, oddly, makes it popular among anglers. The most productive and diverse habitat in most waterways–the shorelines–are along the Washington Channel entirely armored with concrete. Beyond those concrete walls are monocultures — either more concrete or lawns, rather than on-shore wetlands. 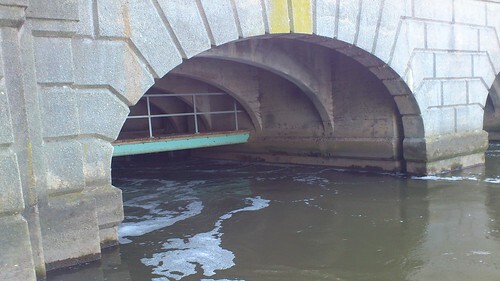 Between the walls, the constant scouring effect of the Channel’s twice-daily flush keeps the Channel relatively deep, so there are scant near-shore wetlands: the central channel is kept at least 9-14 feet deep for navigation purposes, but the entire channel ranges from 3-26′ deep. (The Tidal Basin is a bit more inviting to life, since it’s shallow [5-7′ throughout, average depth of 6.5 ft.] and a bit more placid.) The shallow-water ecosystems at the water’s edge, which combine sunlight, warmth, nutrients, and shelter, are largely absent along both. The Channel is, in effect, a concrete canyon. This canyon isn’t very resilient, either; it can easily flood, as there’s nowhere for water to go when the river rises — or even for the wake from powerboats to do anything other than echo off the walls. The shore edge’s armor has started to degrade, though: a combination of higher water levels, subsidence by the marshy soil, inevitable concrete failure, and erosion means that some areas behind the seawall are now almost permanently wet. Some wetland species might start to colonize these damp pockets, although lawnmowers will probably thwart their progress. Some of the shallower parts of the Washington Channel have demonstrated potential as rich habitat, though. A stretch of older seawall along Fort McNair, beginning in a small lee behind the Titanic Memorial, is a comparative haven for aquatic vegetation and fish. 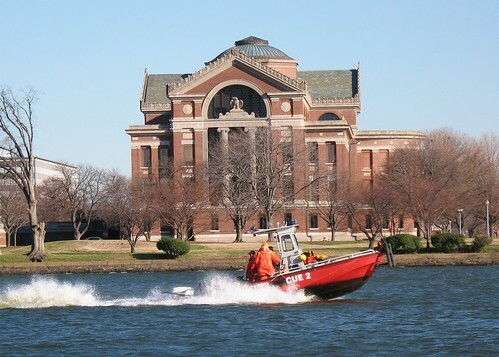 At one point, there was a 10-20′ wide band of submerged aquatic vegetation (SAV) off the fort’s shore — which, according to the NOAA navigation charts, is the shallowest part of the Channel at just 2-5′ deep. These underwater meadows provide valuable fish habitat, particularly for anadromous (half-ocean, half-estuary) species that spawn there before returning to the saltwater estuary downstream. 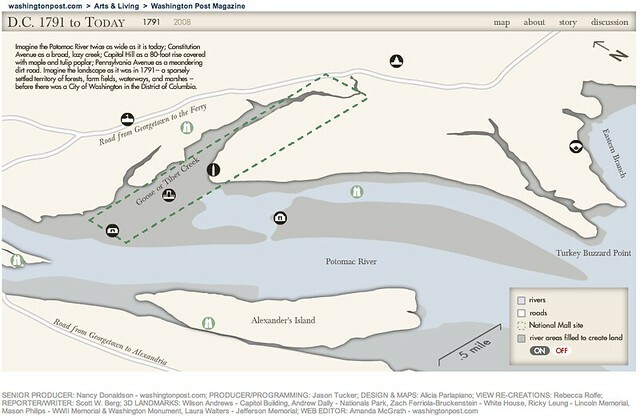 Even as Potomac River water quality has improved, habitat quality in Washington Channel remains poor. 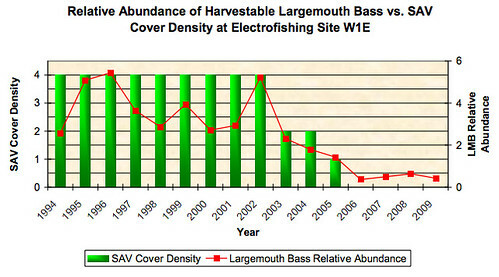 The quantity of SAV (much of it invasive hydrilla, which was still better than nothing) grew substantially in the 1990s, alongside large fish populations. 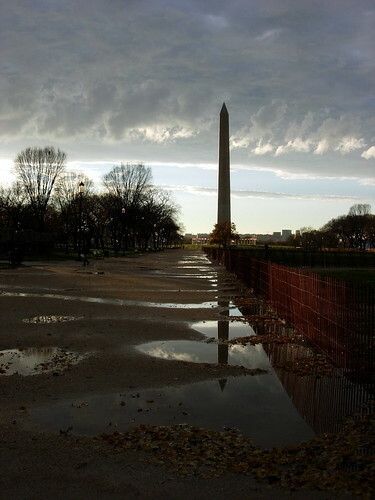 Sadly, major rains throughout 2003 — when the Potomac carried more than 3X as much water as in the drier years 1999-2002, and twice its annual average (MWCOG/VT PDF, pg. 32-33*) — led to severe sediment and nutrient overload throughout the Potomac ecosystem, and thus to large algae blooms in 2004. These two years’ trials devastated established SAV in the upper Potomac estuary, including in Washington Channel, and so far neither plant nor animal life seems to have recovered. 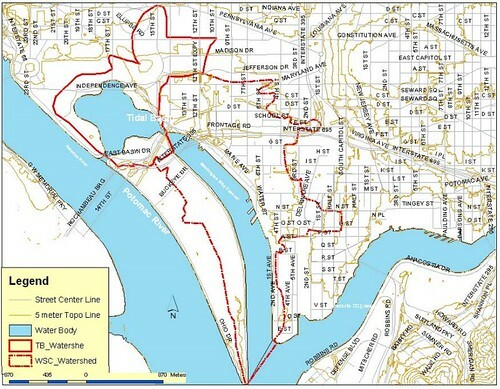 While the Washington Channel may be the local champion for having the least natural stream banks, it’s sadly far from the only such watershed nationally. Perhaps the worst example of an “imprisoned river” is the Los Angeles River, almost all of whose banks were paved back in 1938. Yet nature does abhor a vacuum, and so if you provide adequate habitat (as the Channel did for those few lovely years around 2000), an ecosystem will soon blossom. In Chicago, the Friends of the Chicago River built a “floating fish hotel” to provide a smidgen of near-shore-wetland habitat within downtown’s urban canyon, and plans to significantly expand upon this experiment in the near future. * Incidentally, to update something I wrote earlier about Western and Eastern water systems, the Colorado River’s pre-diversion annual flow was 50% larger than the Potomac’s average flow (at Little Falls) today. 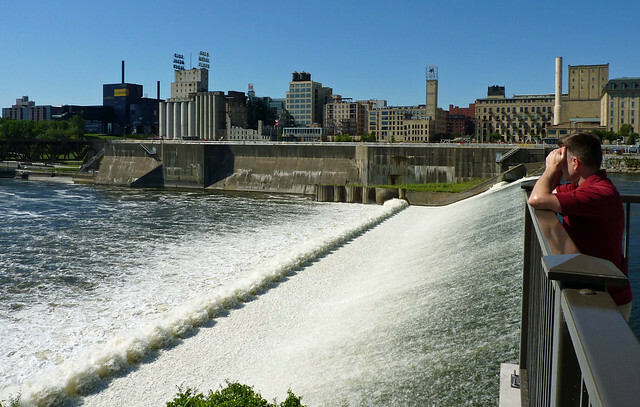 It would rank among the largest Eastern rivers, like the Hudson or Susquehanna. This great map from the Pacific Institute clearly shows my earlier point: the East is well-watered indeed. ** 2018 update: a SAV planting program has succeeded in dramatically increasing SAV in the upper Potomac estuary since 2013, and in increasing juvenile bass populations. 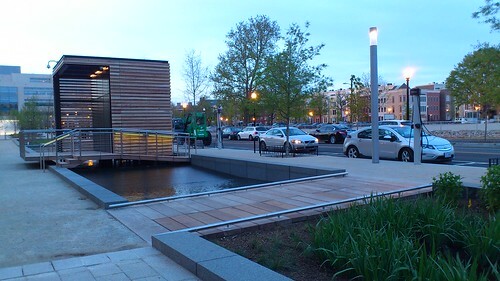 Floating “fish hotels” have been added next to the 7th St. “recreation” pier at the Wharf. In this installment, I’ll take a closer look at how the channel functions today, and what that means for its water quality. Other posts can be found using the tag watershed. 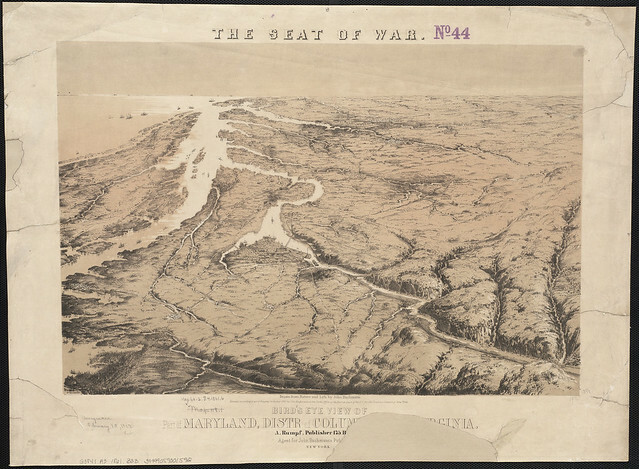 Last week, I examined how the silty Potomac started to clog the harbors around Washington, and mentioned how that resulted in the 1896 construction of the Tidal Basin and the Washington Channel. Today, we’ll investigate in some more detail just how the basin and channel work. 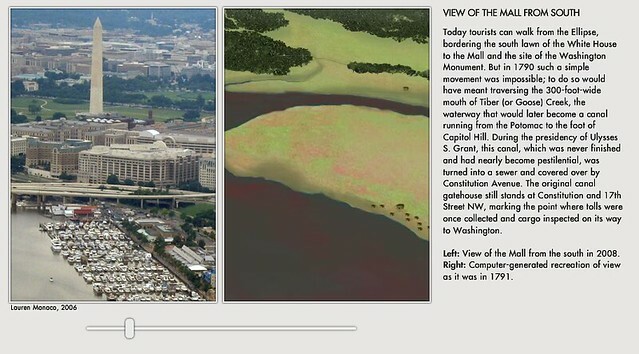 Note the high sediment levels in the Potomac, as indicated by its brownish color — it appears to carry more sediment than the Anacostia. I’ve highlighted the rivers’ silty water flows with greenish arrows. 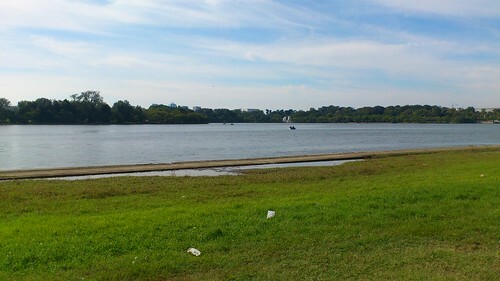 Meanwhile, at the Tidal Basin’s eastern end, an outlet gate leads to the Washington Channel. There, the gates open from the Basin to the Channel: they’re pushed open when the tide falls away from the Basin, spilling those 250 million gallons into the Channel, and they’re pushed shut when the tide rises. 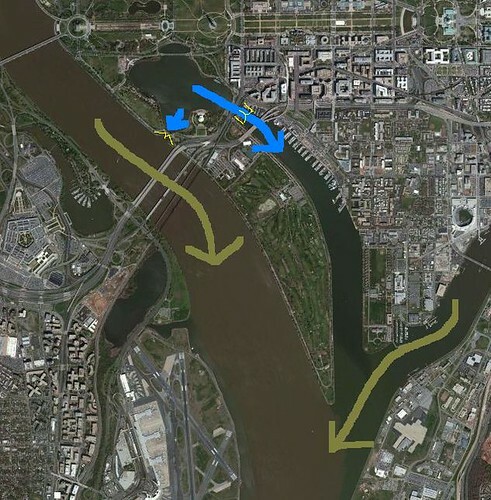 Since the Channel is scoured during both the high and low tides, and is fed by the clearer tides and not by the muddy Potomac, sedimentation is no longer a problem and the channel retains navigable depth without the need for dredging. 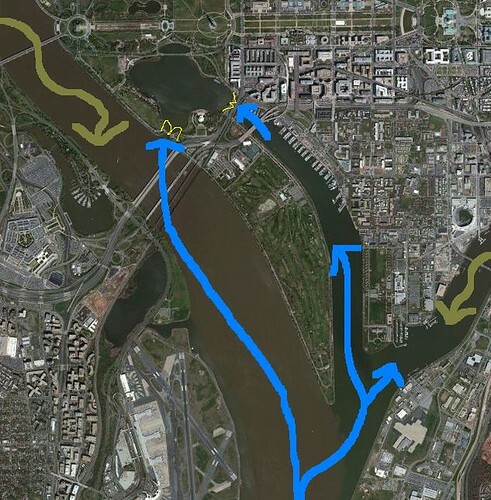 And since the Tidal Basin is fed by the tides — it’s always “high tide” in the Channel — the water within Washington Channel more closely resembles that of the Chesapeake Bay than the Potomac River next door. 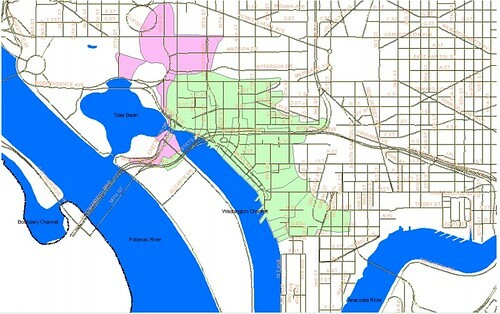 Thus its water is relatively clean, which is curious for a water body within the District of Columbia. 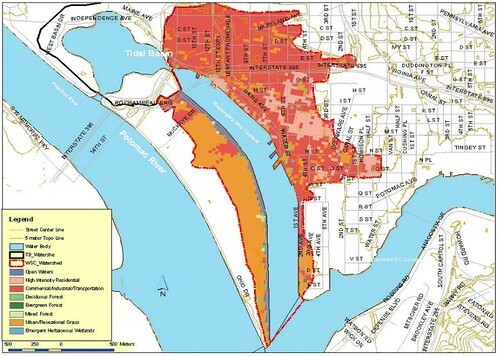 In further installments, I’ll take a closer look at the shorelines, adjacent land use context, drainage, and water quality measures within the Channel.